In Spring 2014, a local Advisory Committee undertook a review of policies for how students are assigned to DC Public Schools. 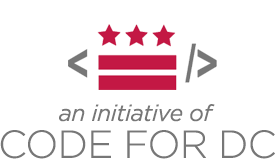 We are an independent civic group called Code for DC. We took the proposals created by the Advisory Committee and made this website to explain what these policies would mean for DC families and collect their feedback. Although these specific proposals are no longer pending public feedback, this site will remain available for those interested. Download the collected response data from the OpenData DC portal. To protect your privacy, we will obscure your address before sharing your responses. "1600 Pennsylvania Ave" would become "16XX Pennsylvania Ave."
Every address in DC is assigned, or zoned, to a school boundary. Students living within that boundary have the right to attend a specific school or schools. These boundaries have not been comprehensively reviewed since the 1970s, even as schools have opened or closed and the city's population has changed. The school you are currently zoned for, ES, has been closed, and we are missing information about the school to which your address is currently assigned. You can look up the schools zoned for your address using DCPS's EBIS tool. The proposed school boundaries would zone you for . Under the new boundary proposal, your address would be assigned to a different school boundary, which would be This means that you would be zoned for instead of . Under the new boundary proposal, your school boundary would remain unchanged. This means you would continue to be zoned for your current neighborhood elementary school, . Under the new boundary proposal, your current school boundary would be Despite the change, you would continue to be zoned for your current neighborhood elementary school, . Due to inconsistencies between school boundaries, your address is zoned for an additional elementary school, . As is explained in the feeder patterns section, the new boundary proposal would zone each address for only a single school. The Advisory Committee says, ""
What's the big picture? The Washington Post created an interactive map illustrating all of the boundary changes for the entire city. Every traditional elementary school "feeds" its students to a middle and a high school. These chains of schools are known as "feeder patterns." In some cases, these patterns are currently inconsistent or result in overcrowded schools. Your current feeder pattern would remain the same under the Advisory Committee's proposal. We're missing information about your current feeder pattern. If you can help us fill in gaps, please consider sending us an email. The boundaries proposal would change the elementary school you are zoned for. As a result, we are showing the proposed feeder pattern of this new school boundary. The Advisory Committee has proposed changing your feeder pattern. In your current feeder pattern, you are assigned to an education campus that offers Kindergarten through Grade 8. The Advisory Committee has proposed limiting this school to the elementary grades (K–5), which is why your new feeder pattern would assign you to a different middle school. In addition to the schools specified by your feeder pattern, your address is currently zoned for an additional middle school, , and an additional high school, . This is a result of inconsistencies between the school boundaries. Currently, students can either follow their feeder pattern or attend their in-boundary school. In the Advisory Committee's proposal, boundaries of the middle and high schools will match their feeder school boundaries, which means that your address would only be zoned for the schools proposed below. Do students follow these feeder patterns? We created a visualization tool to explore how students move between schools in the DC system. Learn more how this proposal would work by reading the Advisory Committee's Policy Example B [pdf]. Currently, all DC students are guaranteed access to a neighborhood elementary school based on where they live. The Advisory Committee is considering replacing this single school of right with a "school choice set." Families would rank three or four schools available in their assigned choice set. If more students select a school than there are spaces, the result would be determined by a lottery. Students would be guaranteed access to one of the schools in the choice set but not to a specific school. Learn more how this proposal would work by reading the Advisory Committee's Policy Example A [pdf]. Similar to elementary school choice sets, the Advisory Committee is considering choice sets for middle schools. Students would be guaranteed access to one of the schools in the choice set but not to a specific school. Middle school choice sets would likely be paired with a plan to give every middle school a special focus, such as two-language instruction or an emphasis on STEM (Science, Technology, Engineering, Math) programs. Which schools would focus on which topics has not been proposed yet. Your proposed middle school choice set lists only a single school, which is a planned new middle school. This is not an error, and it reflects what the Advisory Committee's documents show. Your school boundary is zoned for an education campus that offers Kindergarten through Grade 8. The Advisory Committee has not provided a separate middle school choice set for your boundary. Learn more how this proposal would work by reading the Advisory Committee's Policy Example C [pdf]. Instead of having a single school of right or middle school choice sets, the Advisory Committee is considering guaranteed access to one of the two closest schools to a student's home address. Students would choose which school they prefer but would not be guaranteed access to a specific school. The two middle schools closest to your home are and . Where do students in your neighborhood go to school? We built an interactive map to visualize the patterns of movement between neighborhoods and schools. Like elementary and middle schools, each DC student is currently guaranteed access to a single high school based on where they live. The Advisory Committee is considering eliminating this in favor of a citywide lottery that would not guarantee access to a specific high school. The high school that you would or would not have guaranteed access to is . Looking for a way to search for and compare schools? Check out the LearnDC School Profiles for information about every public school in DC. The Advisory Committee is considering "setting aside" seats for students assigned to low-performing schools. The current proposals call for 10–20% of spaces to be used in this way. The Committee has not yet suggested how to determine which schools are low- performing. Based on the schools in your feeder pattern, our best guess is that you would be eligible to apply for a set-aside during school. Based on the schools in your feeder pattern, we do not think you would be eligible to apply for a set-aside.